Scheduled for April 6 in the Wright State Nutter Center, the Amigos Latinos Gala will raise scholarships for the university’s Latino students. 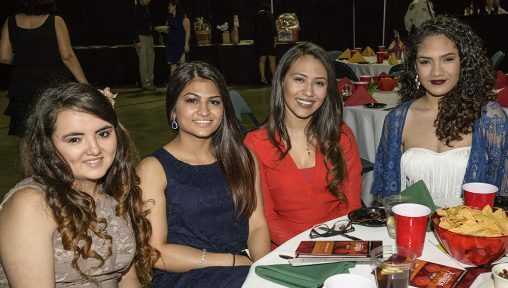 For the fifth year in a row, Wright State celebrates the Latino community and Latino students at the university through the Amigos Latinos Gala. The gala will be held Friday, April 6, from 6 to 10 p.m. in the Wright State Nutter Center. Attendees should register online. Attendees will learn how to salsa dance while listening to Latin music played by Son Del Caribe, one of the top salsa bands in Ohio. A large draw for the gala, the band features several Latino student musicians. More than 500 Latino students from all around the world attend Wright State. One of the goals of the Amigos Latinos Gala is to raise funds for scholarships for Latino students who are in financial need. In the past five years, the gala has raised over $42,000 in scholarships. “Our intention is to make it a little easier financially, to provide financial assistance to those who come to Wright State,” said Julia Acosta, director of the Office of Latino, Asian and Native American Affairs. Scholarships are given out at the event, as well as awards to the community for support shown to Latino Raiders. In the past, the gala has attracted up to 350 people and is expected to bring that many people again this year. Acosta has reached out to other local colleges such as University of Dayton and Sinclair to encourage their student population to come as well. This year, instead of hosting a standard master of ceremonies, speakers will be accompanied by Latino students sharing their story as well as what they love about Wright State. Student testimonials will be featured not only on stage but also in a slideshow and displayed on tables. Wright State President Cheryl B. Schrader will attend the event, as well as state legislators such as Rick Perales and Peggy Lehner. Acosta reached out to Latino student leaders within each college to encourage participation from every area of Wright State. Along with these students, organizations such as the Office of LGBTQA Affairs, the Women’s Center and the Bolinga Black Cultural Resources Center will be represented at the event.